Sant Dariya was born on Kartik Purnima (full moon day), a Hindu calender month in Vikram era 1691 (1634 AD) on Sunday in Ashwin month at Dharkandha in Rohtas District of Bihar (India).He was brought up and remained at that place for most of his life. It is said that the ancestral place of the Saint is Rajpur which is at a distance of 10 miles from Dhakandha,the maternal place of the Saint.Dharkandha is situated at a distance of about 52 miles from Arrah and about 6 miles from Suryapura. Sant descended on the scene when the Mughal Empire was on decline and the British were consolidating their feet.There was absence of a powerful central Govenrnment which resulted in termoil in the society.Public was on the whims and mercy of the then local rulers and suffering immensely.Marathas power was on ascendance in the west.There was moral degradation all around and people were looking for a savior. The savior appeared on the scene in Sant Dariya. Sant Dariya was sent to this world by Anadipurush (Supreme Lord ) to save people from their sorrow and miseries. He presented before the world a path of salvation (Muktipanth).He had to suffer opposition from the orthodox sects at several occasions but he went ahead in his mission with determination. He preached against ritualism and false doctrine prevalent in both Hindu as well as Muslim communities. He preached brotherhood of mankind. He was for unity and harmony amongst Hindus and Muslims. Sant Dariya preached non-violence and was against killing of any living being. He was of the view that unless the lamp of kindness(Karuna) is illuminated in the heart, one cannot proceed on the path of realization of God. Sant preached monism . He preached against incarnation theory of God. He said that the Satprush(Anadi-brahm) is beyond triguna and He never comes into the cycle of birth and death. 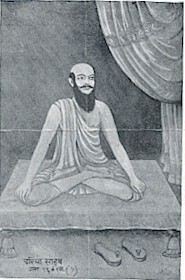 Saint Dariya was Satguru and only the Satguru knew the path that leads to Nirvan(the state beyond the cycle of birth and death).He called his doctrine as Santmat (Doctrine of the saints). There are controversies about his ancestory as also birth and death. Scholars are not in unanimity about his dates of birth and death. A brief mention of the Saint is found in Sahabad Report of Francis Buchanan who visited Dharkandha which was then in Sahabad district of Bihar, in 1810 A.D only thirty years after the parinirvan(death) of the saint. No other proven testimony is available about his date of birth. However, no purpose is served in going into controvercies. Sant was a poet par-excellence and he composed 15,000 padas(verses).There are altogether 37,000 lines in all these padas. Dr. Dharmendra Brahmachari who published research paper on Sant Daria for his Doctor of Philosophy Degree spoke highly of the poetic genius of the saint. Sant Dariya, the great saint poet of the medieval India who preached love and human brotherhood breathed his last in Vikram era 1837(1780A.D) on Friday, the fourth day of Bhado month .